Today, it’s dead easy to get our message ‘out there’. Simply create great content, publish it online, and use social media to increase its reach. Just because you’ve published your best work does not mean your voice will be heard by the right people. There’s A LOT of noise out there and this makes your marketing challenge slightly more tricky. It’s not about what you publish, but about how to get heard and earn attention. It’s about ensuring your voice stands out and gets noticed above everyone else – by your perfect WHO. Interestingly, there’s one key component of your expert message that can make all the difference – if you say it right. We’re getting pretty advanced now, but if you want to connect with customers in this noisy, internet age, you need to give your audience a reason to CARE about what you do. If you don’t, it’s all too easy for you to blend in with everyone else. And it’s for this reasons that I encourage you to uncover your big WHY. Your WHY goes far beyond the benefits of your products and services and instead taps into the deeper philosophy of your business. Your WHY talks about your purpose and the impact you want to make on the world. Your WHY gives your message meaning and it opens up a fresh possibility for your customer. As such, when your WHY aligns with what your customers want, they’ll listen. Martin Luther King changed civil rights in America because he had a vision. His dream connected with tens of thousands of people, and they marched because they believed (and wanted) the same as him. More recently, Steve Jobs transformed the way we perceive gadgets. Apple stood for ‘thinking differently‘ and when people saw how Apple aligned with their identity, they queued for hours to be among the first to buy. That’s the power of your WHY. Your WHY is an interesting concept. For some people their WHY is blatantly obvious. For others, it’s an elusive concept they struggle to grasp. I’ve found you can’t force your WHY. That’s because it’s a knowing that comes from deep within your core. As such, your WHY is a reality that your subconscious will reveal when you really ask (and if you want to get really philosophical here… I think your WHY is only truly revealed when you’re ready to receive). Of course there’s a financial incentive tangled up in your WHY. I call these ‘inward looking WHYS’. Like me, you may have children for whom you want to create a better life. Or you may have lifestyle aspirations too that you need money to fund. So at some level your WHY is of course about money. And anyway, you have to charge a fair price for what you do, or people won’t appreciate the skills and talents that you have. But if you look deeper still, you’ll more than likely discover an ‘outward looking WHY’ too. This is especially the case when you love what you do (and you’re living on purpose). And as a business owner, you’ll get an enormous amount of satisfaction from the difference that you make. So what’s your WHY? Have you discovered it yet? Now the good news is you don’t have to sit around and wait for a moment of enlightenment! You can prompt your thinking to help you get clear on the reason you do what you do. What comes most effortlessly and naturally to you? And I suggest that you keep asking these questions. Don’t accept the first answer as the truth – especially if you’ve not dug this deep before. Your first answers are likely to be superficial. You need to dig deeper. So continually probe. Keep asking WHY? You’ll find that you’ll gradually peel away the layers to arrive at the truth – which your intuition will confirm. When you’ve uncovered your WHY, you have in your hands a piece of marketing gold. That’s because your WHY gives your business activity a deeper, more meaningful purpose. And when your perfect WHO discovers this message (and it resonates with them), your business will feel more relevant. 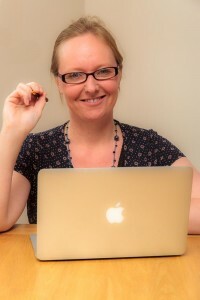 Let’s look at how this works in practice – we’ll use my copywriting business as an example. Now there are thousands of copywriters out there and we all do the same (write copy and create content strategies). As a result, WHAT I do is not a very compelling message. How does my WHAT help me attract the people I can best serve? It doesn’t. And that’s where my big WHY takes over. I believe your message is important and valuable and deserves to be heard. If your offer makes a positive difference to the lives of others, then it’s your responsibility to attract the attention of your perfect WHO. Otherwise others can’t benefit from what you do (and the world becomes a poorer place). So how does this WHY attract a particular sort of customer? Well, if you happen to be the type of person who struggles to get a brilliant idea from their head onto paper, communicating a compelling message can become a HUGE headache. I offer a remedy. YOU see, its not enough to chuck some words onto a page. You also need to communicate in a way that engages your target customer. I can articulate my clients ideas – as if every word was written by them. In terms of attracting customers, this is going to appeal to people who care about their message being authentically theirs. They don’t want any old content. Given my WHY is about making a difference, I realised I’m not about the hard, pushy sell. I’m not about using manipulate copy tricks to force people to buy something they don’t really want. That kind of hard, uncomfortable sell doesn’t sit well with me. 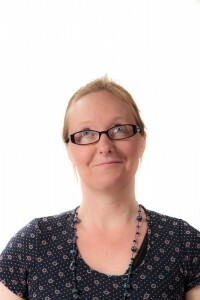 Instead, I’m here to help you create content that allows you to build relationships and your “know, like, trust” factor, whilst connecting your message with your Perfect WHO (in an emotional way). That’s the sort of copy that I create. So you see, my marketing message is about giving business pioneers the opportunity to get heard – even if they can’t write. Therefore, I’m going to attract people who have an important message to share, but struggle to express their vision in words. They need someone who ‘gets’ them, their business, and their customers, and who can create relationship-building content as though they wrote every word. Once you’ve defined your WHY, you need to communicate this message to ensure your perfect WHO knows what you’re about and how you can help. Don’t turn your WHY into a yucky marketing soundbite that isn’t authentic. And more importantly, when you communicate your WHY, make it about your customers. Sure, when you’re doing the thing that you love you get a HEAP of benefit from that. But remember, customers don’t care all that much about you (especially at the beginning of your professional relationship). Instead they want to know what’s in it for them. And that’s why you must communicate your WHY in a way that your customers are clear as to how they will benefit. Don’t use your WHY to brag. Instead, let your WHY open up a possibility for your customer. And in marketing speak, you can then use your WHY to subtly suggest you’re best placed to help. What possibilities do you open up for people? 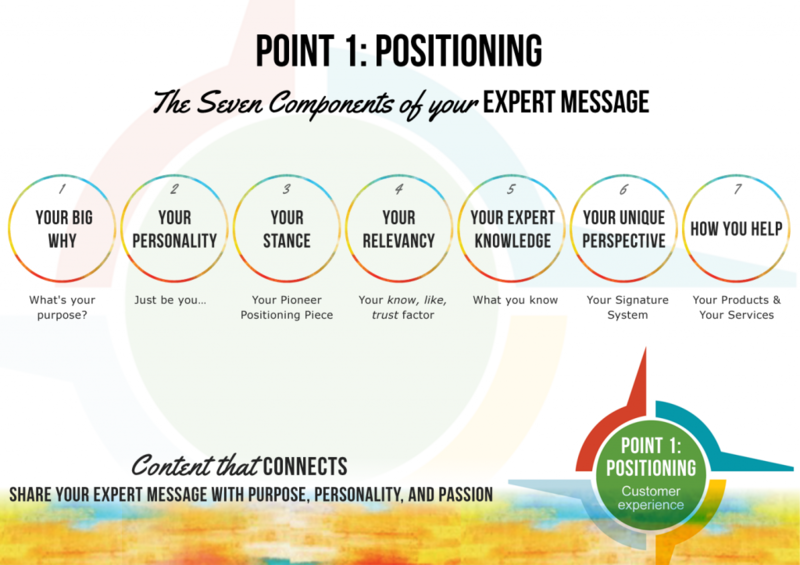 As you can see in the diagram above, there are many more aspects to your expert message and to your positioning. I go into these in much more detail in my Pioneer Content course. This course launches EARLY JUNE 2015. If you’d like to be on the priority list, please enter your details below. P.S. If you’re interested in discovering more about the importance of your WHY, do watch Simon Sinek’s Start With Why TED Talk. It had a HUGE impact on me and a strong influence on how I now think in my business. You can watch it HERE.